Think family-friendly "Robocop" meets Miyazaki's "Castle in the Sky"
“Astro Boy” resembles a more family-friendly combination of “RoboCop” and “A.I.” with references to “Freaks,” “The Seven-Year Itch” and Hayao Miyazaki’s “Castle in the Sky,” to name a few, for those who’ll recognize them. Given my somewhat idiosyncratic taste in family films, I should probably start this review with a disclaimer — if you thought I was crazy for championing “Meet the Robinsons” and “Mr. Magorium’s Wonder Emporium,” then I’m probably never going to convince you that “Astro Boy” is a delightfully funny and poignant family film that’s not afraid to address adult themes. Parents, obviously, should decide for themselves if their children are ready to see a movie that deals with, among other things, death, self-sacrifice, waste and pollution, political corruption, exploitation and familial rejection. At least one parent at the screening I attended left early with her young daughter, so this isn’t a movie for the youngest of filmgoers. 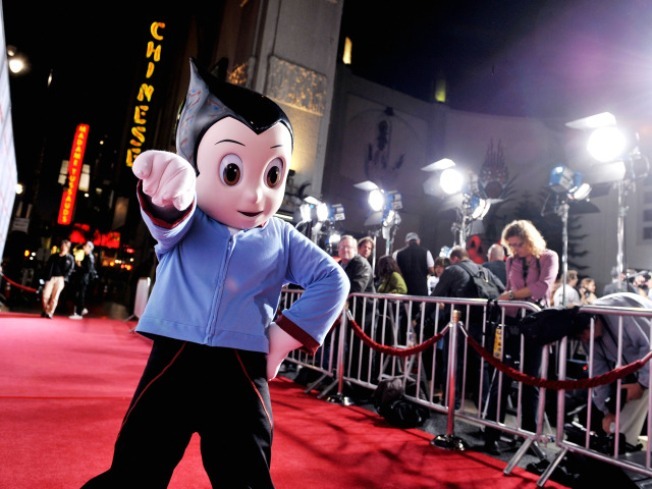 For the rest of us, however, “Astro Boy” resembles a more family-friendly combination of “RoboCop” and “A.I.” with references to “Freaks,” “The Seven-Year Itch” and Hayao Miyazaki’s “Castle in the Sky,” to name a few, for those who’ll recognize them. Like Miyazaki, “Astro Boy” creator Osamu Tezuka is considered one of the giants of Japanese animation, and it’s likely that Tezuka die-hards won’t cotton to what’s been done to his creation here. (Those fans will bristle at Astro Boy’s long pants as much as Spider-Man purists freaked out over that movie’s organic web-shooters.) If you’re unfamiliar with the original manga or cartoon incarnations of the character, or are willing to allow the feature filmmakers to take liberties with Tezuka’s creation, you’re in for a surprisingly intelligent animated experience. Teenage Toby Tenma (voiced by Freddie Highmore, “Charlie and the Chocolate Factory”) idolizes his father Dr. Tenma (Nicolas Cage), who runs the powerful Ministry of Science in Metro City, a utopia that floats above the polluted and scrap-covered Earth. Robots do all the work in Metro City, and when they become obsolete, they’re dumped onto the heaps below. Dr. Tenma and his colleague Dr. Elefun (Bill Nighy) have separated matter from outer space into a positive blue core and a negative red one. The nefarious General Stone (Donald Sutherland) — campaign motto: “It’s Not Time for Change” — wants to use the red core to power the destructive Peacekeeper robot he can use to declare war on the surface people, thus boosting his approval ratings. The experiment goes wrong, and Toby is killed. Grief-stricken, Dr. Tenma creates a powerful robot with all of Toby’s memories, but finds himself repulsed by his creation. (The scenes in which the new Toby discovers he’s a robot by flying above the city outdoes anything in “Amelia” when it comes to conveying the joy of flight.) Rejected by Dr. Tenma and pursued by General Stone, who wants the blue core powering him, Toby winds up on the Earth’s surface, where he’s taken in by a gaggle of lost children being tended to by the seemingly friendly robot repairman Hamegg (Nathan Lane). Renamed Astro by a group of would-be revolutionary robots — the fact that they’ve been programmed not to harm humans gets in the way of their revolt — the mechanical Toby keeps his android identity secret from his new friends, only to be forced to fight for his life in gladiatorial robot games and then to protect Metro City when General Stone revives the Peacekeeper, which has run amok. As with “Magorium’s,” the trailers for “Astro Boy” don’t convey the warmth and specialness of the movie. This dazzling CGI-animated adventure combines lots of clever, blink-and-you’ll-miss-them jokes (a philosophical tome entitled “Descartes: Before the Horse,” for instance) and a genuinely heart-tugging story about family, belonging and even martyrdom. I fear “Astro Boy” is doomed to be, at best, a cult favorite, but — given its pedigree as yet another reboot of a vintage intellectual property — it’s one of the most pleasant surprises I’ve had at the movies all year.